Explore the city and turn the police department around! 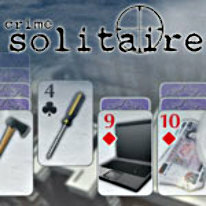 In Crime Solitaire, the Mayor of Topley and the Chief of Police have vowed to save the force from shame by enforcing ancient and little-known laws. As a rookie to the force in modern-day Topley, it's your job to hunt down a new breed of felon and take them out of society. Earn promotions and use power-ups as you explore the city and turn the police department around!